The Trouble with Terkel is a Danish made animated film that was directed by Thorbjorn Christoffersen and Stefen Fjeldmark. Now this shares a lot of its style of humour from Sausage Party, that was a film I could barely stand due to its focus on trying to be as offensive as possible. As such the type of humour to be found in this movie is the absolute polar opposite of what I enjoy, there wasn't a single joke here that amused me and so that could not help but make me dislike what I saw. 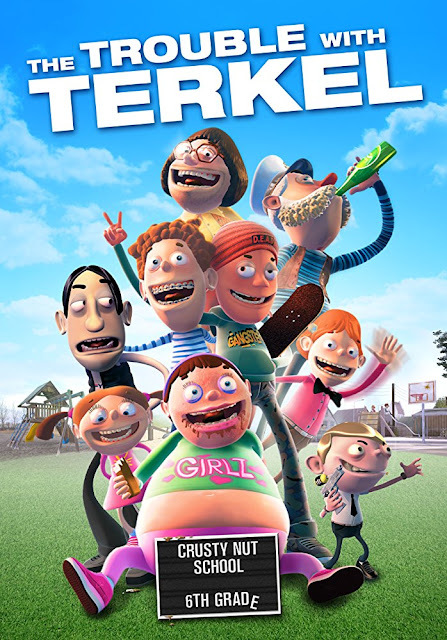 Terkel (Mike Olsen) is a typical teenager in what appears to be an alternate dimension in which it is normal for everyone to be foul mouthed and nasty to each other. One day he starts getting death threats from a person unknown and he starts to fear for his safety. It all comes to a head on a school camping trip organised by his teacher Mr. Balsac (Shark Firestone). This is pretty mediocre stuff, but thankfully at least the animation is fine enough. It is nowhere as near as good as Pixar but I have seen far far worse. The animation is functional even if characters look unfinished, and they have a kind of unique look to them in that they resemble muppets in how they move. While I thought the actual script was awful the voice actors all do actually pretty good jobs, there was no one at all who I felt were bad at their lines, and it was great to see (well, hear) Chad Ridgely (Massacre on Aisle 12, 6.66 PM) as the voice of Uncle Stewart. This has English dubbed over the original language and no attempt is made to lip sync so is a lot of flapping mouths with no sound coming out. There are quite a few song and dance numbers throughout this, none of them were any good, and one rap played out in the original Danish with not even subtitles to help make sense of what was being said. The one concession was a header saying something like 'this next part will make no sense', stuff like this just added to the unpolished feel. The plot itself takes a very long time to get going, the death threat part was slow to build up and was only in the last ten to fifteen minutes it got took out into the forefront of the picture. This wasn't boring though, even with nothing really happening of note there was a sense of infinity to this, like it was never ending, but not in a tedious way, more that it just seemed to be constant with no real feeling of a beginning, middle or end. When the horror part does get going it led to a nice little twist, not on who the secret antagonist was (pretty easy to guess), more to do with that character's motivation. In a ham fisted way it tries to make a story about bullying but goes about it in a bad way. Characters have no sense of goodness about them, the biggest case in point being when Terkel contributes to a bullied girl commiting suicide. There is no repercussion to this event at all, no one really mentions it much after, the school seemingly not caring, even the victims sister didn't care in the slightest, this event in particular left me with a bad taste in my mouth. All too often the humour relies on characters swearing at each other, all the characters from the students at the school, to family members and teachers are all constantly swearing and insulting each other. There wasn't a single character who seemed half decent in the core cast, maybe the narrator (who like in Dead & Breakfast appears as a character within the movie rather than just as a voice). Much of the attempted humour comes from coming up with different ways of insulting people, really not what I like at all. Terkel is a terrible main character, he is both whiny, weak and a follower. By the films end there isn't a single bit of redemption for him, it ends with him the exact same as when the film starts. On the subject of the ending it has one of the worse end credit sequences I have seen in a long while. It is a series of conversations done by the characters as if it were behind the scenes footage of the actors performing their scenes. The conversations sounded so artificial that it sounded to me like several different scenes all playing out over the top of each other. 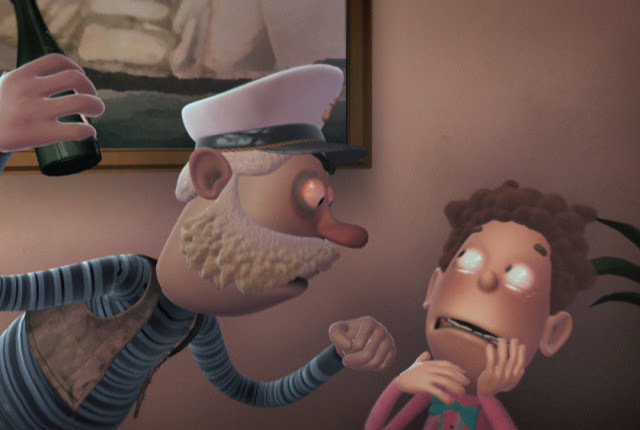 The Trouble with Terkel just felt mean spirited, it really was not a feel good movie despite the bright cartoony visuals. In terms of horror outside of the finale there was a decent enough nightmare sequence Terkel has. Going back to the humour though, vulgar jokes, insinuations of paedophilia, excessive violence - it all just left me cold. Jeez I feel old writing this review, maybe if I was back in my teens myself it might have appealed more, but certainly not nowadays. Saying that I do like South Park, but that handles the offensive humour in a way that is usually actually funny. The Trouble with Terkel is out to buy now thanks to the great people at Indican Pictures, if this sounds like something you would enjoy then by all means check it out, you may be pleasantly surprised.